Amongst the tangle of fronds washed onto beaches after fierce storms, there will be delicate red laces, massive rubbery straps, slimy thin sheets, and brown beads that pop with pressure. All have come from a narrow zone of the rocky coast – the realm of seaweeds. Seaweed is food for the millions of creatures which live in the sea. Beds of seaweed also provide shelter, and a safe place for fish and shellfish to breed. What are the parts of seaweed? Seaweeds have a holdfast that anchors them to a surface, and a blade which may be divided into fronds. Large seaweeds can also have a stalk or stipe, which joins the blade to the holdfast. Green seaweeds are found between high- and low-water marks, where there is plenty of sunlight. A common species on New Zealand coasts is the edible sea lettuce. Brown seaweeds are medium to giant-sized – kelps are the largest. One familiar type is Neptune’s necklace, which has water-filled beads to stop it drying out. Red seaweeds grow in water up to 25 metres deep. There are 550 species in New Zealand. 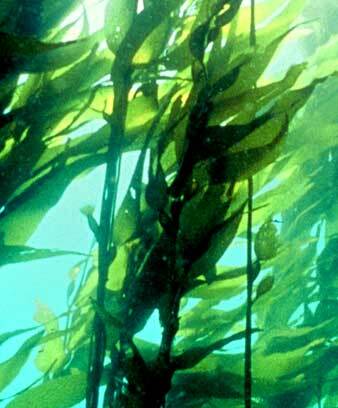 Kelp forms underwater forests over 20 metres tall, providing food and a place to live for many sea animals. The forests can be of common kelp, bull kelp or bladder kelp, which is New Zealand’s largest seaweed. Asian kelp arrived in the country’s waters in the 1980s, but it is a threat to native habitats. Māori used some green and red seaweeds such as karengo for cooking. Bull kelp was made into pōha (kelp storage bags), by splitting open the blades and blowing into them. They were used to hold muttonbirds. Agar, from some red seaweeds, is a jelly used to grow bacteria and to preserve food. Two other jelly-forming thickeners come from seaweeds, and are used in cosmetics and food. Karengo has been harvested from the 1980s and is processed into a food seasoning. Tiny mussels are collected from washed-up seaweed and sent to mussel farms, where they will grow and be harvested for eating.